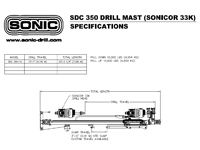 SDC DRILL MAST assemblies are a fast, convenient and economical option for customers wanting to utilize an existing piece of equipment and convert it into a SONIC DRILL. 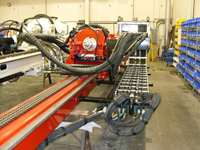 SDC DRILL MASTS are available in numerous lengths and are constructed of a single structural tube which is strong and light weight. 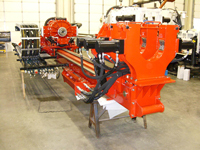 The feed system is a hydraulic cylinder / multi-stand chain driven system with spring take-up which can generate up to 24,000 lbs of pull up and 16,000 lbs pull down. 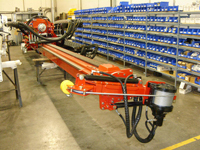 DRILL MASTS are available complete with our award winning SONICOR 50K drill head, high speed diamond coring head attachment, SPT hammer mount, cradle side shift, 60 or 90 degree head tilt, hose management system (carrier), high pressure power coated tubing, top mount jib hoist arm with rotation and extension, up to 12-3/4" casing breakout table (2 or 3 level) and mast dump. 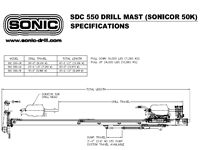 SDC has supplied complete DRILL MASTS for converting tracked pile rigs, rotary drills, RC drills, Morooka carriers, off shore skid platforms, construction drills, heli-port and numerous other platforms into SONIC DRILLS. 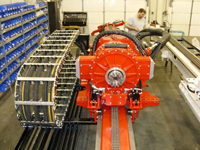 Note: Subject to SDC engineering review of available equipment horsepower and hydraulic pump circuit specifications.